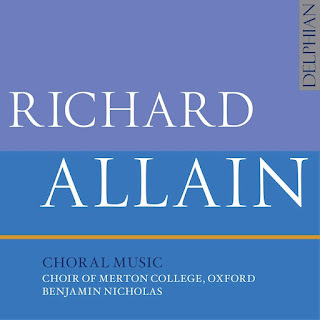 I first came across Richard Allain's music at one of Alistair Dixon's New Lamps for Old concerts with his ensemble Chapelle du Roi. For these, contemporary composers were paired with a pre-existing Renaissance or Tudor polyphonic piece and asked to write a setting of the same text. Richard and I were on the same programme, along with a variety of other composers. 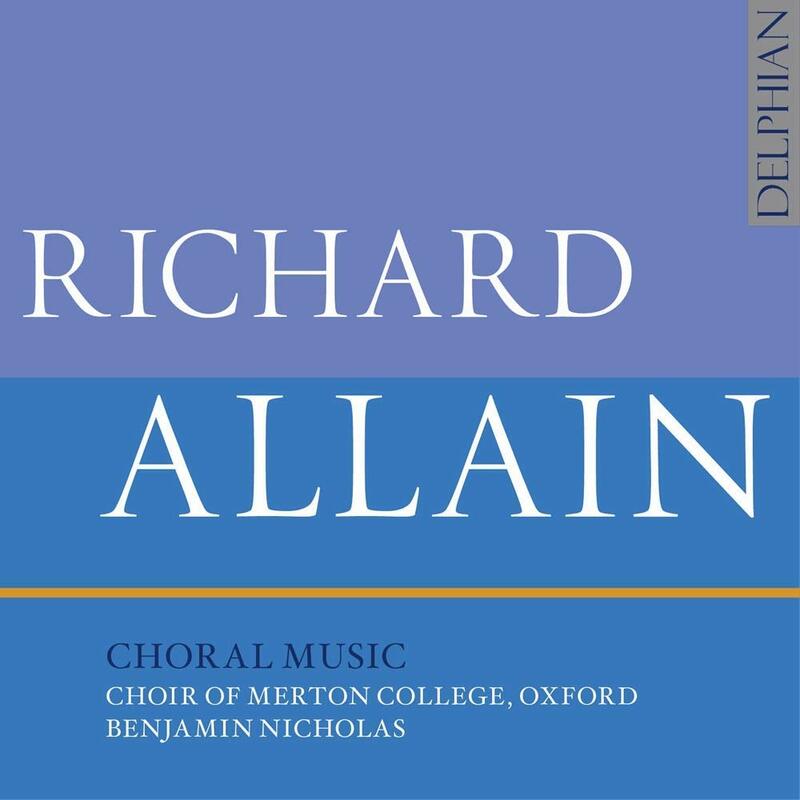 Now there is a disc on the Delphian label devoted to Richard Allain's elegant and well made contemporary choral music performed by the choir of Merton College, Oxford, conducted by Benjamin Nicholas. It is, by and large, a disc of smaller-scale pieces. The longest work on the disc, Videte Miraculum, revisits the 'New Lamps for Old' concept. Commissioned by Suzi Digby and ORA, it is a response to Thomas Tallis' respond Videte Miraculum and Allain uses Tallis as a cantus firmus, surrounding it with a series of gorgeous textures. This work very much gives a sense of Allain as a composer whose roots are in the past yet who creates his own sound-world. In Videte Miraculum we are aware of Thomas Tallis, but Allain makes his music undulate around Tallis and it is not just richly gorgeous, there are thoughtful moments too. The other substantial work is the Magnificat and Nunc Dimittis from The Norwich ServiceMagnificat with twinkling organ and bright, clear women's voices, is very striking indeed. As ever with discs like this, I wish we had more substantial works on the disc. As it is, there are perhaps slightly too many well-made occasional pieces though it has to be admitted that Allain's wedding anthem Cana's Guest is one of his most performed pieces. In style, Allain can sometimes veer towards the Rutter-ish and I have no doubt that his music must be very grateful to sing. He is the master of lovely textures and luscious chords as in If music be the food of love or the opening of The Beloved, this latter illustrates another apparent Allain trait, the gradual build up from quiet to climax. O Spring Day fits into this mould, but is notable for its use of saxophone solo (Finn McEwen) over the top of the choral music. Joanna Wyld's programme note tells us plenty about the music, but the disc has little biography for the composer himself. More importantly, we do not learn why this composer and these pieces? I would have been glad of an introductory note from conductor Benjamin Nicholas setting things in context. From this disc, it seems that Richard Allain is that rare thing, a useful composer. One able to write grateful, approachable music, music that won't scare the audience, patrons and sponsors, yet music which is intelligent, imaginative, full of personality and grateful to sing. I know that, listening to the music on this disc, I would be delighted to be singing his music and I suspect many people will feel the same.